Fort Bunker Hill Park in Brookland is where one of the many forts built to protect Washington, DC during the Civil War was situated. 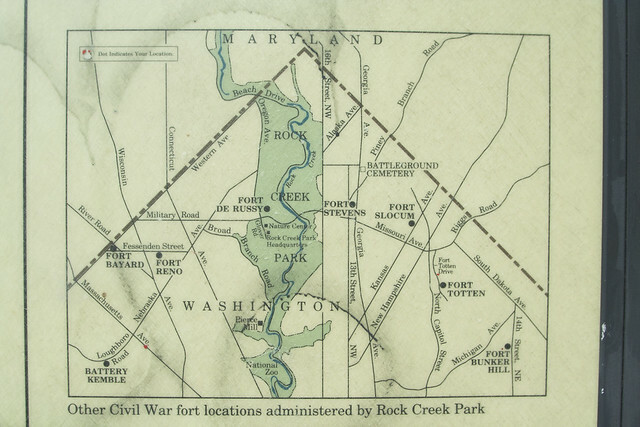 Known as the Fort Circle Parks today, the Union Army controlled these forts that circled the city to dissuade invaders. Most of the forts never really came into serious conflict and none were ever captured by the Confederate Army. Fort Bunker Hill was itself built in 1861 by the 11th Massachusetts Infantry, with 13 mounted guns. The city is much bigger today, and has expanded beyond where the forts would have protected it. In the 1930’s, the Conservation Civilian Corps (CCC) built some infrastructure in the parks in general, and specifically an amphitheater at Fort Bunker Hill Park. Apparently remnants of the amphitheater still exists, but the fort is long gone. Today Fort Bunker Hill Park is only one block square with a few trails that weave around and through it, covered in dense forest. When I walked on the trails and through the brush searching, I didn’t see anything of note, but at the time I didn’t know what to look for and where. It was striking how isolated I felt walking along the trails. I could have been convinced I wasn’t in the city, but rather far out in the woods. It’s cool that such green spaces exist in our urban neighborhoods, and cooler still that there is such history attached to them. Maybe we’ll look at some of the other more prominent Fort Circle Parks in the future, ones where evidence of the forts still exist. * The National Park System has 417 ‘units’ in the USA with 20 designations. The ‘Other’ designation is largely reserved for units found in or near Washington, DC. Read more on the Fort Circle Parks here. Read more about Fort Bunker Hill Park here.